Although usually forgetting to take along my camera, this time however I made a few snapshots during two recently held Volvo events I happened to attend. The first one was a Duett meet on May 14 in the south of Holland. This get together took place at the grounds of the local Volvo dealer in Veldhoven. Originally planned for June for some reason it was fixed at an earlier date. But since the 14th of May also happened to be "mothers-day", attendance was less than expected. Moreover we got some nice cold rainy weather blown over from the UK so all in all the organisers must have been a bit disappointed. 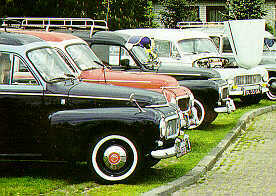 The Duett with the bonnet high up showed a gas converted engine which in Holland since recently means low mileage cost. Reason is a change in Law that cars over 25 years of age are free of road tax. Gas has always been cheaper than petrol but road-tax on gas was much higher and only profitable when making a lot of miles a year. But with road-tax gone for classic cars it now pays to convert ones car to LPG. For those yearly driving a lot of miles the choice is of course obvious and...as you already may have guessed...prices for aged solid cars are rising! One week later a meeting was organised by the 1800 Register and held at the Dutch/ German border near Arnhem. This time the weather-forecast had been more promising and the venue was the local Tolkamer Yacht Club at the border of the river Rhine. Nearly at destination I crossed roads with an immaculate looking yellow 1800 ES of which both occupants were also trying to find the right spot to be. Upon my arrival the organisers of the event had their video camera at hand in order to catch all participants for future pleasure. At the end 29 owners with 1800's showed up, this much to the satisfaction of everybody attending. While treated with coffee and cake inside the Club's restaurant, outside the locals were admiring all these shiny "oldies", surely wondering how they all survived through the years being in such a good shape. In the early afternoon all engines were started for a drive along country lanes and dykes to finally end up at Tolkamer's "boulevard", a sort of elevated promenade along the quay normally reserved for pedestrians only but by special permission granted to be used for parking the cars in line. And while left behind to be admired by other locals present, the drivers and family boarded a chartered saloon-steamer for a one hour trip on the river Rhine (note Volvo banner). Unfortunately I could not join the group because I had to hurry home for an early start direction Luxembourg. Later inquiries however learned, that everybody had enjoyed the day and that it had been worth every driven mile. Until next meet.